* The Soviet OKB (experimental design bureau) founded by Mikhail Mil made a specialty of building huge helicopters to carry heavy cargoes. In the new Russia, the Mil organization continues to produce these impressive giants. 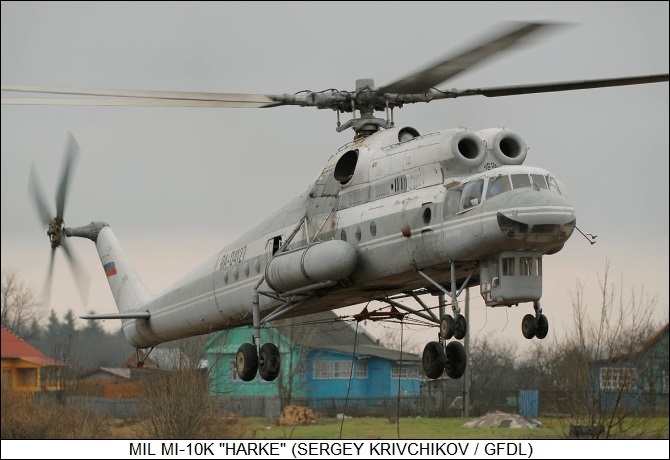 This document provides a history and description of Mil heavy-lift helicopters, as well as competitive machines worked on by the Yakovlev OKB that amounted to little. * The Mil organization began work on their first heavy-lift helicopter in late 1952, when OKB engineers came up with a preliminary design for a rotorcraft that could carry a payload of more than 11 tonnes (25,000 pounds) over a distance of 240 kilometers (150 miles). The design concept was designated "V-6", where "V" stood for "Vertolyot (Helicopter)". The design was approved for development in June 1954. The big rotorcraft was seen as useful for both commercial and military service. The Soviet civil airline organization, Aeroflot, needed the machine for operations in trackless backwoods environments, particularly Siberia, and the military could use it to haul rocket launchers and other heavy weapons. The initial V-6 prototype took to the air for the first time on 5 June 1957, with test pilot R.I. Kaprelyan at the controls. A second prototype, much closer to production standard, flew for the first time in 1958. The machine was ordered into production as the "Mi-6" in 1960, even though full flight trials wouldn't be completed until 1962. About 50 were built early on by a factory in Moscow, but most production was by State Factory 168 in Rostov-on-Don, where about 874 were turned out to end of production in 1980. The Mi-6 was displayed to the world at the Paris Air Show in 1965, with onlookers suitably impressed. NATO assigned the type the reporting name of "Hook". * The Mi-6 was powered by twin Soloviev D-25V (TB-2VM) turboshaft engines with 4,100 kW (5,500 SHP) each. Access panels to the engines were opened and closed hydraulically, and were sturdy enough to be used as work platforms by maintenance crews. The Mi-6 featured a huge five-bladed main rotor with metal blades, and a four-bladed tail rotor with blades made of plastic-impregnated wood built around steel spars. There was a tailplane on the tail boom ahead of the tail rotor. The main rotor system -- as well as pitot tubes, windshields, and engine inlet -- used an electrothermal de-icing system, but the tail rotor was de-iced by an alcohol-based scheme. The Mi-6 featured a crew of five, including pilot, copilot, navigator, radio operator, and flight engineer. It could carry 70 troops on tilt-down seats along the walls, with 20 more seats fitted in the center of the cargo bay. Other possible loads included 41 stretchers and two attendants; an internal cargo load of 11,340 kilograms (25,000 pounds); or a sling cargo load of almost 8 tonnes (17,500 pounds), with the hoist cable dropped through the cargo bay and out a hatch in the floor. The machine had two passenger doors on the left side of the fuselage, with one passenger door on the right rear side of the fuselage. There were jettisonable aircrew escape doors on both sides of the cockpit, with the cockpit also featuring bulged side windows to improve visibility down and to the rear. There was a hatch on the roof for service access to the engines. The Mi-6 had hydraulically-operated rear clamshell doors and a ramp for cargo loading; the cargo bay had a pulley block system and a winch with a lift capacity of 800 kilograms (1,760 pounds). Stub wings with a span of 15.3 meters (50 feet 2 inches) were fitted to provide lift in forward flight; early production featured wings whose angle of incidence could be adjusted by ground crews, but they gave way to fixed wings set at an incidence of 15.75 degrees. The wings were removeable and often taken off when the machine was used as a flying crane, since at low flight speeds the wings simply became dead weight and blocked the rotor downwash. The Mi-6 was fitted with an Ivchenko AI-8 auxiliary power unit (APU), mounted on the left clamshell cargo door, for engine starting and ground power; early Mi-6 production did not have the APU. The helicopter had fixed tricycle landing gear, with dual wheels on the castoring nose gear and big single wheels on the main gear, the main gear being supported by strut assemblies. There was a tail bumper to protect against ground strikes. The Mi-6 could be fitted with four auxiliary fuel tanks for ferry flights; two of these tanks were mounted internally and two were mounted externally, one above each main landing gear assembly. Standard avionics provided day-night, all-weather flight capability. Military variants included an identification friend or foe (IFF) transponder and a radar-warning receiver (RWR) system. The Mi-6 could also be fitted with a single DShK 12.7-millimeter machine gun on a flexible mount in the nose. Apparently other weapons fits were evaluated as part of a notion to use the Mi-6 as an oversized helicopter gunship, but the big helicopter's vulnerability outweighed its ability to carry a heavy load of weapons. The single machine gun was strictly for self-defense. The initial prototype lacked wings. Both prototypes were powered by Soloviev TV-2VM engines instead of the production D-25 engines; were fitted with spatted main gear, which apparently was also fitted to early production machines; and did not have provisions for the nose gun. Along with the military Mi-6, a civilian heliliner version, the "Mi-6P", was introduced in 1965. It could carry up to 80 passengers and was fitted with toilet, galley, and soundproofing. It did not have rear clamshell doors, instead being fitted with a tail fairing with a hinge-down "airstair" passenger door. Sources claim it had square passenger windows, but it is difficult to find any photos of Mi-6 machines with such a feature. In the early 1970s, improved "Mi-6A" and "Mi-6PA" variants were introduced, featuring updated avionics; increased service life; and a number of other minor changes. During that decade, there was consideration of a generally modernized Mi-6, the "Mi-6M", with features such as retractable landing gear, but it didn't happen. * At the time of its first flight in the fall of 1957 and for many years after, the Mi-6 was the world's biggest operational helicopter; it was also the USSR's first production turboshaft-powered helicopter. The type won the Sikorsky trophy in 1961 as the first helicopter to exceed 300 KPH (186 MPH) in level flight, and set a number of other performance and load records as well, some of them standing for many years. Mi-6s were operated by both Aeroflot and the Soviet military, particularly the Soviet Air Force. 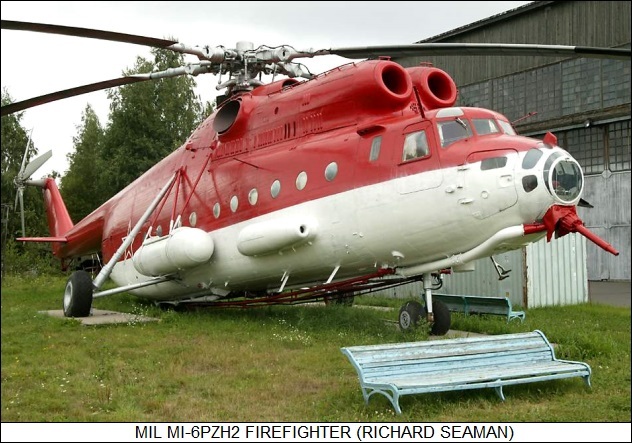 A prototype of an "Mi-6PZh" fire-fighting helicopter was built, though it was destroyed in a crash. The idea still seemed sound, and so a number of improved "Mi-6PZh2" fire-fighters were built by conversion, with a spray nozzle in the nose. An "Mi-6PS" search and rescue (SAR) variant, primarily intended for recovery of Soviet cosmonauts. With the introduction of the Mi-6A series, an updated SAR variant, the "Mi-6APS", was introduced as well. The "Mi-6TZ-SV" battlefield tanker, which carried fuel tanks and a pumping system in its cargo bay to provide a mobile ground-refueling facility for frontline forces. The "Mi-6VKP Hook-B", which was fitted as a "command support" helicopter, littered with antennas for communications gear and other equipment. It was followed by the more capable "Mi-22 Hook-C". A number of variants were built on an experimental basis, but were not put into serious operational service -- including machines to transport and support battlefield tactical ballistic missiles; electronic countermeasures (ECM) platforms; a radio relay platform; and antisubmarine warfare (ASW) platforms. * Soviet Mi-6s saw action in the invasion of Czechoslovakia in 1968 and during the Afghan War of the 1980s; they were used for resupply and transport and not for assaults, being seen as too vulnerable for frontline combat. During the Chernobyl nuclear plant disaster in 1986, Mi-6s were used for logistical support, and to dump loads of sand in an attempt to damp out the damaged reactor. The crews had to be rotated out when their radiation dosages exceeded a safe limit, and the Mi-6s that did this work were buried on the site when they were done. Some Mi-6s performed operations in the confused wake of the breakup of the USSR in the 1990s, some ending up in the hands of states that fragmented off the new Russian state. Over 60 were exported, with Mi-6s being operated by Algeria, Bulgaria, Egypt, Ethiopia, India, Indonesia, Iraq, Pakistan, Poland, and North Vietnam. Egypt's Mi-6 fleet was destroyed on the ground during the 1967 Six-Day War; they were replaced and did fair service during the 1972 Yom Kippur War in the resupply role. The North Vietnamese used Mi-6s during the Vietnam War to lift jet fighters from their airfields to remote locations as protection against US air strikes. Ethiopian Mi-6s served in the country's war with the breakaway Ogaden province, and Iraqi Mi-6s served in the Iran-Iraq War of the 1980s. Some Iraqi Mi-6s even served in the invasion of Kuwait in 1990, but the fleet was largely or completely destroyed in the subsequent Gulf War. A dwindling number of weary Mi-6s remained flying in Russia into the 21st century, but in July 2002 one crashed, killing 21 people, and later in 2002 the Russian Ministry of Transport ordered that Mi-6 operations cease. Possibly some lingered in operation elsewhere, but for practical purposes, that was the end of the Mi-6 story. * After the introduction of the Mi-6, its utility in the "flying crane" role suggested that it might be useful to use the design as the basis for a new machine dedicated to that purpose. The Mil OKB began work on the "V-10", as it was designated internally, in early 1958. Thanks to leverage from the Mi-6, construction of the first prototype was rapid, with initial flight of the "Mi-10" -- as the type had been officially designated -- on 15 June 1960. Unfortunately, this machine crashed in May 1961, four of the five crew being killed and the machine wrecked beyond repair. A second prototype was almost ready at the time of the crash and soon joined the test program. This machine was demonstrated to the world at the Tushino air show in July 1961, with NATO assigning it the reporting name "Harke". There ended up being no rush to get the machine into production, however, both because of technical difficulties and shifting priorities, with the first production machine not flying until September 1964. All production was at Plant 168 at Rostov-on-Don, the same plant that built the Mi-6. 40 of the first-series Mi-10 machines were built. One was sold via a Dutch intermediary to an American company named Petroleum Helicopters INC for oil and gas work in Bolivia; this was the only Mi-10 machine of any type that was exported. * The Mi-6 and Mi-10 shared the same engines, transmission, hydraulic system, and rotor system, and the two machines were parts-compatible to a large degree. However, the Mi-10 featured a cut-down fuselage designed mostly for passenger accommodation; it had large external fuel tanks and wide-track, four-legged, extended landing gear to allow the big helicopter to straddle bulky cargoes. Interestingly, the right-side gear were 30 centimeters (1 foot) shorter than the left, which caused the Mi-10 to tilt 1.5 degrees to the right when parked. The reason this was done was to ensure that all four landing gear lifted off the ground at the same time, preventing a potentially dangerous sideslip on take-off. All four landing gear had dual wheels and shock absorbers; the nose gear castored for ground handling. The prototypes had single-wheel landing gear. Since the M-10 flew slightly nose-down, the cockpit was raised at an angle of 4.5 degrees relative to the fuselage centerline. Special wheeled pallets were designed to accommodate payloads for carriage by the Mi-10, with a pallet held in place by hydraulic arms linked into the helicopter's landing gear. 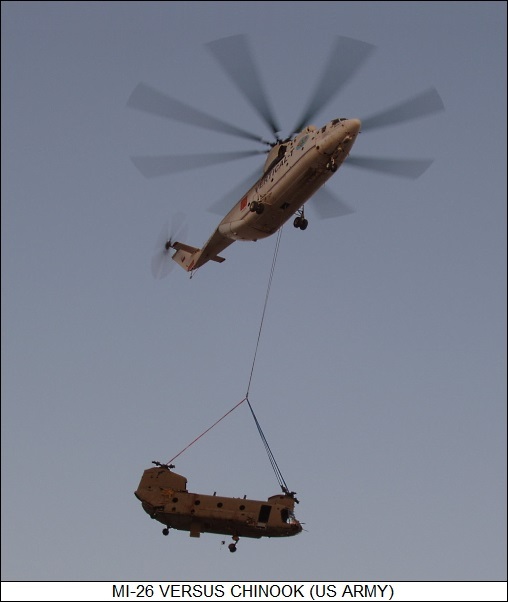 Boxy payloads could be fitted with connecting knobs to allow them to be hauled without a pallet, and of course the Mi-10 could handle sling loads. The Mi-10 could normally carry 12 tonnes (13.2 tons) of payload, but it could haul 15 tonnes (16.5 tons) over relatively short distances. Sling loads were limited to 8 tonnes (8.8 tons). A closed-circuit TV system was installed to allow the crew to keep an eye on the cargo. Since the Mi-10 was designed primarily for the flying-crane role, it was not fitted with stub wings. The Mi-10 had a normal flight crew of three and could accommodate 28 passengers. Crew and passenger entry was through a door on the left front of the fuselage, with steps being built into a landing gear assembly to permit access. There was a drum under the nose that was actually a telescoping tube to allow the crew to get out in an emergency, the tall landing gear making escape otherwise somewhat problematic. Cargo could be hauled in the fuselage, such cargoes being loaded through a side door on the right rear fuselage, fitted with a boom and a winch. One Mi-10 was modified to take on world flight records, being fitted with fixed tricycle landing gear scavenged from an Mi-6, the mainwheels being spatted; there was also a little two-wheel bumper gear assembly under the tail. This "Mi-10R", as it was designated, was stripped of all unnecessary gear and set several flight records in 1965. The Red Air Force obtained 20 "Mi-10PP" battlefield ECM platforms, these machine being standard production Mi-10s carrying a bulky "Steppe" jamming module. There were also a few experimental conversions that didn't go into production, including a tactical missile deployment system and various trials platforms. There was only one other production variant of the Mi-10, the "Mi-10K", which dropped the pallet scheme. It featured much shorter landing gear and a glassed-in rear-facing gondola under the cockpit, with full flight controls, to allow a copilot to position slung payloads. The crew / passenger door featured a fold-down "airstair". Initial flight of the prototype was on 6 September 1966, but due to various technical difficulties, it didn't go into production until 1974, again at the Rostov-on-Don factory. 17 were built, including two updates from original production Mi-10 machines, giving total production of the Mi-10 series as about 55 machines. In service, the Mi-10 proved a useful machine with unique capabilities, able to haul bulky loads into isolated regions. It did leave something to be desired in terms of flight qualities, however; being very "cluttered", to no surprise its handling was not the best, particularly with cumbersome loads -- and worse, in foul weather the loads could accumulate ice that would drag the helicopter out of the sky. Its vibration levels were unpleasantly high. The majority of Mi-10s served in Aeroflot colors, the military having no strong requirement for the type, and only really operating the Mi-10PP jammer platform -- though some Mi-10s were used for military cargolift during the Afghan conflict. Most of the Mi-10s were out of service by the end of the 21st century, but a handful lingered on for a few more years. * Following the Mi-6 and Mi-10, from 1959 the Mil OKB began work on an "ultra-heavy" helicopter, which was initially given the OKB designation of "V-12". A number of configurations were considered; the design finally chosen for flight development was a side-by-side rotor system -- a fairly common notion in the early days of helicopter development, but it had otherwise generally disappeared from that time. Work proceeded slowly, the initial prototype not flying until 27 June 1967. It was not the most fortunate of beginnings, the machine being put back down on the ground quickly due to oscillations, blowing a tire in the process. Although no real damage was done, OKB engineers found it a discouraging sign, though the trials program otherwise went fairly well. The V-12 was demonstrated at the 1971 Paris Air Salon, making a very strong impression on Western observers. NATO assigned it the reporting name of "Homer", with Western sources describing it as the "Mi-12", though it would never get a service designation. However, development still continued to be slow, with a second prototype not joining the program until 1973. As it would turn it, it was the last Mi-12 built. The V-12 was the biggest helicopter ever flown. It was bigger than a Boeing 727 jetliner, and could carry 120 passengers. In 1969, a V-12 carried a payload of over 40 tonnes (44 tons) to an altitude of over 2.25 kilometers (1.4 miles). The machine featured a five-bladed rotor at each wingtip, each rotor powered by two Soloviev D-25VF turboshafts with 4,125 kW (5,500 SHP) each, for a total of four engines. The wings had a "reverse taper", meaning they were wider at the tip than at the root. The engine, transmission, and rotor systems were derived from those of the Mi-6; the side-by-side rotor arrangement allowed these systems to be used with few modifications. Engine starting was by a TA-6 APU in the forward fuselage. Fuel tanks were in the wings, and an external tank could be fitted on each side of the fuselage. The V-12 featured fixed tricycle landing gear, with twin tires on each gear assembly, and clamshell loading doors in the rear. It was flow by six flightcrew. The protracted development of the V-12 was due not only to the leading-edge nature of the machine -- nothing on its scale had ever been flown before -- but also because military requirements kept shifting, and there was some sensible reluctance to put such an expensive machine into production. As is not uncommon in protracted development programs, it was finally bypassed by better ideas, with the program canceled in 1974. One prototype remains on static display at Monino in Russia; it is unclear if the other survives. The V-12 was actually a fairly impressive machine on its own merits, and certainly its development gave the Mil organization extensive experience in the design of very large helicopters. There was contemplation of a scaled-up derivative, the "V-16", with much the same configuration, but a stretched fuselage and more powerful engines; of course, it never happened. * One of the main reasons that the Mi-12 was canceled was because Soviet turboshaft engine development had advanced to the point where the requirements for which the oversized helicopter had been designed could be met with a less cumbersome machine. Work on the "Mi-26" had been authorized in 1971, with the initial flight of the first prototype on 14 December 1977. The first production Mi-26 was rolled out from the Rostov-on-Don plant in 1980 and entered Soviet military service in 1983. It was demonstrated at the Paris Air Salon in June 1981, where it was one of the star attractions; it was assigned the NATO reporting name of "Halo". The Mi-26 design was clearly influenced by the Mi-6, with a similar overall configuration and in fact similar dimensions, but modernized and much more capable. The Mi-26 is arguably a more elegant machine than the Mi-6, with the lines of a porpoise. It is currently the world's largest production helicopter. The Mi-26 is only slightly heavier than the Mi-6, but has a much greater cargo capacity of 20 tonnes (44,000 pounds), as compared to 11.8 tonnes (26,000 pounds) for the Mi-6. The Mi-26 is capable of carrying heavy sling loads, and replaced the Mi-10 as well. The Mi-26 is powered by two Lotarev D-136 turboshaft engines, providing 8,550 kW (11,400 SHP) each. It is fitted with an eight-blade main rotor, with the blades made from fiberglass with steel spar cores and fitted with titanium on the leading edges. The rotor blades have an electrical de-icing system -- all the de-icing is electrical, in fact -- and the rotor hub is made of titanium. 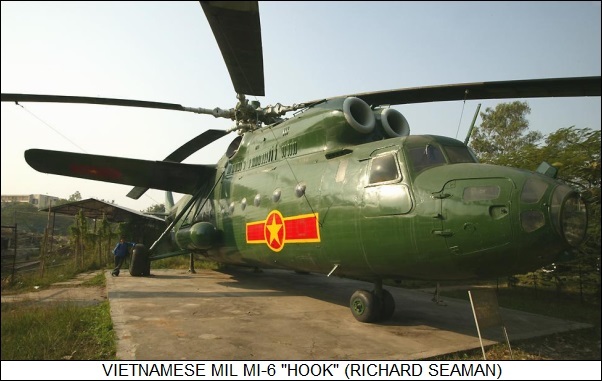 It is the only production helicopter in the world with an eight-blade main rotor, which Mil officials claims gives a very smooth ride, much smoother than that of the Mi-6. The tail rotor has five blades, made of fiberglass. The tail is fitted with a fixed tailplane to help maintain pitch stability. The incidence of the tailplane can be adjusted by ground crews. The Mi-26 does not have stub wings as fitted on the Mi-6. It has fixed tricycle landing gear, with dual wheels on each gear, and a tail bumper to deal with ground strikes. The height of the main landing gear can be hydraulically adjusted to assist cargo loading, and sensors are fitted to the landing gear to give the loaded weight of the machine through a cockpit control-panel indicator. The airframe features built-in handholds and footholds to help in field maintenance, with engine service doors able to be used as work platforms. The rotorcraft has a built-in TA-8V APU, fitted under the flight deck, to provide engine starting and power to systems when on the ground. The Mi-26 has a standard crew of five, including pilot, copilot, navigator, flight engineer, and flight technician. The cockpit side windows are bulged to improve visibility. The cockpit does not have its own external crew doors as does the Mi-6. Three TV cameras are fitted to allow observation of sling loads. The cockpit is pressurized, though the cargo bay is not. There is a four-seat pressurized passenger compartment behind the cockpit. There are 40 fold-down seats along the cargo bay, and 60 more seats can be fitted in the center aisle of the cargo bay. There are three passenger doors, two on the left and one on the right, that open downward and have built-in steps. The machine has hydraulically-actuated clamshell doors and a ramp on the end, plus a roller conveyor and two 2.5-tonne (5,500-pound) capacity electric winches on rails to move payloads around in the cargo bay. The basic Mi-26 is intended for military transport service, and has an IFF transponder, self-defense avionics, plus chaff-flare dispensers -- a set of dispensers being mounted in a prominent pack on each side of the fuselage. The Mi-26 can also be fitted with cockpit armor if need be. The Mi-26 is not armed, though there are mounts in the windows for light infantry machine guns. Military Mi-26s were painted in disruptive camouflage colors. * Although priority in production of the Mi-26 was for military use, manufacture of a civil variant, the "Mi-26T", began in 1985. It was very similar to the baseline Mi-26 military variant, being a general-purpose machine intended primarily for load hauling, but lacked military avionics, self-defense kit, and provisions for mounting weapons. It featured an enhanced flight-control system to improve handling of sling loads. A slightly improved derivative was introduced into production in 1995, being known as the "Mi-26TS", or "Mi-26TC" for the export market. There was some consideration of an "Mi-26P heliliner" version of the Mi-26T civil series, but there was simply no great need for a civil helicopter with such large passenger capacity. Russian aerospace manufacturing organizations did a fair amount of "thrashing" in the 1990s, rolling out a bewildering range of one-off prototypes and modifications with an even more bewildering range of designations, in hopes of obtaining buyers. They included several versions of optimized fire-fighters; a flying hospital with a surgical theater; a geophysical survey platform; a frontline battlefield support tanker; an ECM platform; an ASW platform; and a battlefield command post, the "Mi-27". There was no great interest in these concepts, partly because the standard Mi-26 / Mi-26T was adaptable to a wide range of uses. One concept for which there has been fair interest is a dedicated flying crane version of the Mi-26, with several prototypes built featuring secondary controller gondolas -- and in particular the very interesting "Mi-26K", with a cut-away fuselage giving it the appearance of an oversized version of the American Sikorsky S-64 Skycrane. At least 300 Mi-26s have been built. It is highly regarded by users and crews for its utility, good design, and good handling -- the last being greatly aided by its excess of engine power, that in itself establishing a notable improvement over its underpowered Mi-6 predecessor. The type was or is in the hands of former Soviet Union nations including Ukraine, Kazakhstan, and Belarus, though some were bought back for Russian service. At least twelve were sold to India, with sales of ones or twos or threes to Cambodia, Congo-Kinshasa, Laos, Malaysia, Mexico, North Korea, Peru, and South Korea. A Greek civil operator bought one, while the Mi-26 has been leased for operations in several other countries. Soviet Mi-26s saw some service late in the Afghan conflict and in the 1986 Chernobyl disaster. They have since seen action in the regional squabbles that followed the collapse of the USSR, one being shot down near the Armenian border in 2002, with 12 on board killed, and another shot down in Chechnya in 2003, with the loss of all 118 on board. The unique capabilities of the Mi-26 make it a very desireable asset for international relief operations, with a number serving in UN colors. The Mi-26 services are available for a price from the Rosvertol organization. An Mi-26 was rented out by the US military during the Afghanistan campaign of 2001:2002 to pick up a downed Boeing CH-47 Chinook helicopter, with the "Halo" making the Chinook almost seem toylike in comparison. * The Mi-26 remains in production. An updated version, the "Mi-26T2", was introduced in prototype form at the Tushino air show in 2005. The Mi-26T2 featured a "glass cockpit" with five color displays, plus a digital flight control system with analog backup, a self-test / service system, and generally updated avionics -- including a navigation suite featuring a GPS / GLONASS navigation satellite receiver, the suite permitting operations in international airspace. The Mi-26T2 also featured new Ivchenko-Progress / Motor Sich D-136-2 turboshafts with full authority digital engine controls (FADEC), and maximum take-off power raised to 8,690 kW (11,650 SHP) each. Each engine could operate redlined at 9,325 kW (12,500 SHP) for a half hour. Along with domestic use -- numbers in Russian service are unclear -- it has been obtained by Algeria and Jordan. A further upgraded variant, the "Mi-26T2V", performed its initial flight in 2018. The airframe is generally unchanged, but the helicopter's avionics system is substantially upgraded, with improved flight control and navigation systems for all-weather operation -- as well as a cockpit enhanced for use with night-vision goggles, plus modernized communications and self-defense systems, along with better crew protection. * The Mi-6 had a predecessor of sorts, in the form of the "Yak-24" helicopter, developed by the Yakovlev aircraft OKB. The Yak OKB had focused on fighters during World War II, but began to investigate helicopter designs after the conflict, flying an experimental demonstrator, the "Yak EG" -- "EG" being for "Eksperimentahlniy Ghelikopter" -- in 1947. It was a bare-bones, two-seat machine with a coaxial rotor scheme; it flew trials for a year or so, proving a useful learning experience, but it did not lead to a production machine. The Yak EG was followed in 1948 by two prototypes of the "Yak-100", which gave up the coaxial rotor scheme in favor of the more typical main-tail rotor configuration. It looked like a near-clone of the American Sikorsky S-51 helicopter; Yak OKB engineers insisted it wasn't a copy; no doubt, the Yak-100 was completely different at a detail level, but it's hard to think the Yak-100 didn't use the S-51 as a model. Although trials with the Yak-100 went well, the decision was made to produce the competing Mil Mi-1 light helicopter, and the Yak-100 went nowhere. The Yak OKB then went on to work on a heavy-lift helicopter, the Yak-24, with four prototypes built -- two flying machines and two for static test -- the first flight prototype performing its initial free flight on 3 July 1952. It was, at the time, the world's biggest helicopter, and in fact the Yak-24 set several world load-altitude records in 1955. It was a tandem-rotor machine with a boxy fuselage, its configuration suggesting an earlier attempt at a US Boeing Vertol CH-47 Chinook, using piston instead of turboshaft propulsion. The Yak-24 was of mixed construction, with a steel tube frame partly covered by aircraft aluminum alloy sheet, partly by fabric. It was powered by twin Shvetsov ASh-82V 14-cylinder two-row air-cooled radial engines, each providing 1,065 kW (1,430 HP) continuous power. In development, it could carry 30 troops on tip-up seats along the sides of the fuselage; or 18 stretchers plus medical attendants; or up to two tonnes (4,400 pounds) of cargo. There was a rear door with a ramp for driving in light vehicles and such. A TKB-481 12.7-millimeter machine gun could be installed on a flexible mount in the nose as defensive armament. Development did not go smoothly, extreme levels of vibration being a particular problem. However, the Yak-24 was finally approved for production, with initial service deliveries in 1956. The prototypes and early production had vee-configuration tailfins; this was later changed to a tailplane with strong dihedral and tailfins mounted on each tip. There was a little rudder tacked on to the tail end of the helicopter to help keep it flying straight. Yak-24K: A VIP transport, with a luxury interior, oversized passenger viewing windows, and an airstair door. Two were built by conversion from standard Yak-24 machines; it is unclear if they were put into service. Yak-24U: A improved Yak-24, featuring a wider and reinforced fuselage, wider rotor blades, plus other refinements, allowing it to lift up to 4 tonnes (8,800 pounds). It could be distinguished from the baseline Yak-24 by the fact that it had a flat tailplane, eliminating the dihedral; the rudder on the end of the helicopter was eliminated as well. It seems to have replaced the baseline Yak-24 in production. Yak-24A: A civil passenger heliliner based on the Yak-24U, one prototype built. A "Yak-24P" with twin Ivchenko AI-24V turboshafts instead of the Shvestsov radials was considered, but not built. Yak-24T: A conversion of a baseline Yak-24, intended as a tactical pipline layer, the pipeline being used to supply fuel to forward military installations. It featured pipe racks on the sides and carried appropriate pipe-laying kit. The scheme was evaluated, but the idea proved clumsy, and was not followed up. One Yak-24 was also evaluated as a tanker to refuel frontline bases, while another was fitted with a panoramic movie camera on a pivoting frame under the fuselage. It is unclear how many Yak-24 helicopters were built -- no more than a hundred, maybe no more than a few dozen. It appears it was not very satisfactory and had a short service life, being replaced by the Mi-6. Yakovlev never built any more helicopters. A "Yak-32" heavylift helicopter was considered, being an enlarged tandem-rotor machine with four turboshaft engines, roughly in a class with the V-12. It was an attractive machine, but it didn't happen. The Yak-32 designation was also applied to a single-seat light strike aircraft that did fly in prototype form, but never went into production. 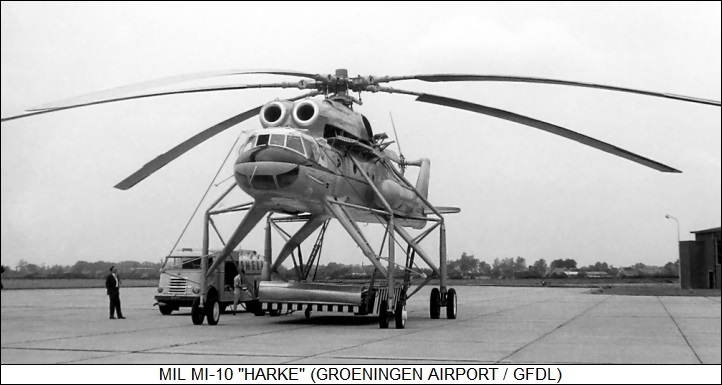 * One of the interesting footnotes to the Mil heavy-lift helicopters is a design for a "super-heavy" helicopter promoted by the OKB in the early 1980s, designated the "Mi-32". This machine looked like three fat pipes joined together in triangular configuration, with Mi-26 rotor and engine systems at each vertex of the triangle, and a cockpit up front. It didn't go beyond the model stage. Not to be outdone in absurd giant helicopter designs, the Yak OKB came up with a monster of their own, the "VVP-6", which was intended to fly a battery of "Guideline" surface-to-air missiles (SAMs) to a forward base for air defense. The VVP-6 looked like a long rectangular box with six stub wings, and six SAMs perched on the back; there was a six-blade rotor at the end of each stub wing, each powered by four turboshaft engines -- for a total of 24 engines. Support kit for the SAM battery was hauled inside the fuselage. The VVP-6 didn't progress beyond the model stage, either. JANE'S ALL THE WORLD AIRCRAFT, 1970 and 1998 editions. THE ENCYCLOPEDIA OF MODERN WARPLANES, edited by Bill Gunston, Barnes & Noble, 1995. MODERN FIGHTING HELICOPTERS by Bill Gunston & Mike Spick, Crescent Books, 1996. MIL'S HEAVY HELICOPTERS by Yefim Gordon with Dmitriy and Sergey Kommissarov, Midland Publishers, 2005. 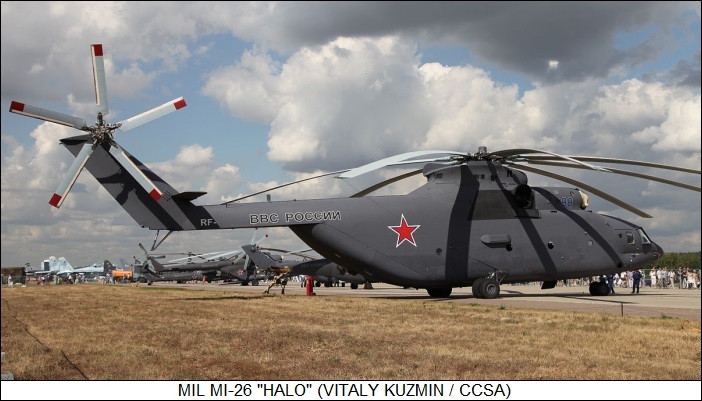 "Mi-26 Makeover" by Maxim Pyadushkin, AVIATION WEEK, 28 March 2011, 29.
v1.0.1 / 01 jan 02 / Review & polish. v1.0.2 / 01 jan 02 / Grounding of Mi-6, minor cosmetic changes. v1.0.3 / 01 dec 04 / Review & polish. v1.0.4 / 01 nov 06 / Review & polish. v1.0.5 / 01 apr 09 / Review & polish. v2.0.0 / 01 apr 11 / Major rewrite. v3.0.0 / 01 apr 13 / Yak helicopters. v3.0.1 / 01 apr 15 / Review & polish. v3.0.2 / 01 mar 17 / Review & polish. v3.0.3 / 01 feb 19 / Review, update, & polish.